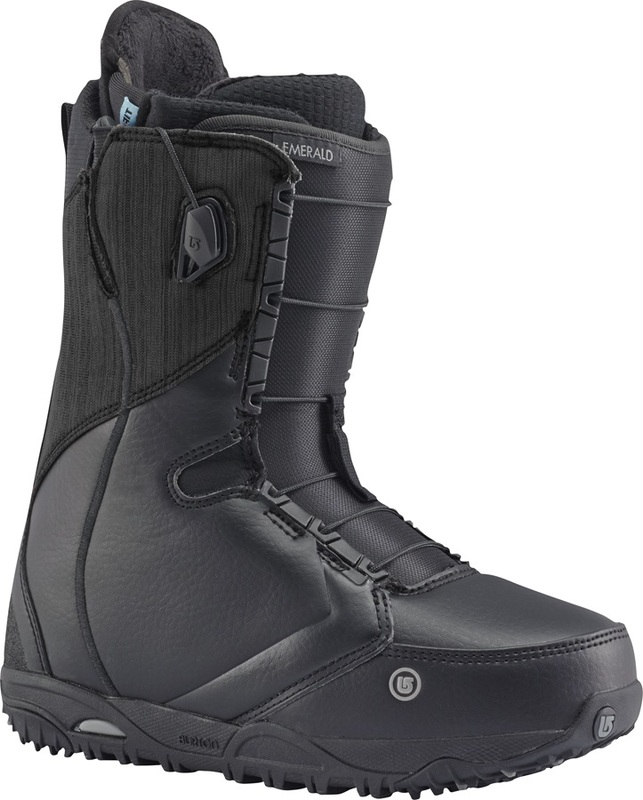 The 2017 Burton Emerald women's snowboard boots offer total comfort and provide a quicker response from your snowboard with less effort allowing finer control of your movements which is great when you're charging down those groomers. The Speed Zone Lacing System provides separate lacing control for the upper and lower sections of your boot so you can adjust the fit just as you like with complete ease. The Speed Zone system uses New England ropes which are virtually indestructible and are unique to Burton. They're so confident in these that they give a lifetime warranty on all New England laces! The Emerald includes an Imprint 2 liner with 3M Thinsulte insulation to help keep your toes nice and toasty all day long. The DynoGrip outsole has superior cushioning and improved board feel and won't weigh you down. It also includes a tougher rubber heel and toe for more durability. This boot also includes Burton's new sleeping bag reflective foil to reflect heat back towards your foot so you will never get cold feet. Plush Cuff finishes the liner off in style and comfort meaning after a full days riding you'll barely remember you're wearing boots! The medium flex PowerUP Tongue rebounds back into place after you've stomped a landing or tail pressed a whole run whilst the new GripLITE Backstay offers lateral support to your leg and keeps the boot durable while the velcro closure on the liner hold you in place for a snug fit. All of this means that you have to put less energy into your board to get response. The 2017 Burton Emerald boots are for women of all abilities who want all day comfort with premium features to make your days riding more enjoyable. Speed Zone Lacing - Lightning fast lacing with separate upper and lower fastening for individual adjustment. Uses New England ropes exclusive to Burton for super durability - and it includes a lifetime warranty!